• The Mexican Government ignored recommendations from the Civil Society Focal Group on Business and Human Rights in Mexico. • Lack of inclusion of affected communities, lack of transparency and absence of some key actors among the main omissions. 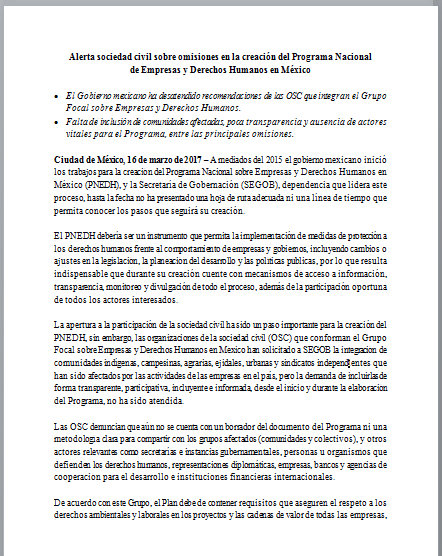 Mexico City, March 16, 2017 – In mid-2015, the Mexican government started to develop the National Business and Human Rights Program in Mexico (PNEDH in Spanish) and, to this date, the Ministry of the Interior (SEGOB in Spanish), the government institution leading the process, has not presented an adequate roadmap or a timeline to know the steps that will follow its creation. The PNEDH should be an instrument that enables the implementation of measures to protect human rights at risk due to governmental and corporate conduct, including changes or adjustments in legislation, in development planning, and in public policy making. For this reason, it is essential to ensure adequate mechanisms for transparency, access to information, monitoring, and outreach during the entire process, in addition to the timely participation of all stakeholders. Civil society participation has been an important step towards the development of the PNEDH; however, the Civil Society Focal Group on Business and Human Rights in Mexico has requested SEGOB the integration of indigenous and rural communities, urban groups, and independent trade unions that are negatively affected by business activities in the country. There hasn’t been an effective response to the request to include them in a transparent, participative, informed and inclusive way, since the beginning of the process to elaborate the Program. CSOs point out that there is still no draft of the Program or a clear methodology for sharing it with affected groups, and other relevant actors such as ministries and government bodies, human rights defenders, diplomatic representations, companies, banks, development cooperation agencies, and international financial institutions. According to this Group, the Program must contain provisions that ensure respect for environmental and labor rights in all the corporate projects and in their value chains, as well as requirements about human rights impact assessments (thus strengthening environmental and social impact assessments already required by law), ensuring that national development planning is built on social, environmental and human rights sustainability criteria, and protecting human rights defenders. Similarly, state-owned enterprises must have mechanisms to protect and respect human rights, both within their structure and with regards to the communities they operate in. This analysis about the omissions in the process is based on the work of the Civil Society Focal Group on Business and Human Rights in Mexico, which has identified priorities through a national baseline assessment and made recommendations to the government that have not yet been addressed. The mentioned CSOs will continue to inform civil society about the process of creating the PNEDH, together with other organizations and groups that become involved. The Focal Group on Business and Human Rights is a coalition of CSOs that promotes and defends existing legal frameworks to ensure that national and international corporations do not commit human rights violations, and is formed by the following organizations: Centro de Información sobre Empresas y Derechos Humanos (CIEDH); Centro Mexicano de Derecho Ambiental (CEMDA); Comité de Defensa Integral de Derechos Humanos Gobixha (Código DH); Proyecto de Derechos Económicos, Sociales y Culturales (ProDESC); Proyecto sobre Organización, Desarrollo, Educación e Investigación (PODER); and Oxfam México, accompanied by Peace Brigades International (PBI), Asociación Interamericana para Defensa del Ambiente (AIDA), and Servicios y Asesoría para la Paz (Serapaz).